Dementia is not uncommon in geriatric cats. With elderly cats, some health and behavioral changes are inevitable and natural. They're not as dissimilar to humans as you might think: Just as with people, feline seniors often experience senility and many of the issues associated with it -- think forgetfulness and overall feelings of confusion. Cats age much quicker than humans due to their significantly shorter lifespans. In fact, cats are sometimes considered to be senior citizens at as young as age 7. However, for the most part, the decline in cats' cognitive abilities begins around about 10 years old. When cats have feline cognitive dysfunction, they experience a wide array of auditory, visual and joint problems. The condition is extremely prevalent in geriatric cats, especially in those past 15 years old. Feelings of confusion and disorientation are common in feline senility. Your formerly super-sharp kitty may all of a sudden not know where the comfiest window perch in the house is. She may not even remember where her litter box is or where you keep her food bowl. Because of this confusion, your pet may perpetually seem "lost." She may roam around your home endlessly with no apparent destination or purpose. If your cat always was a chatty Cathy, meowing left and right to anyone who would listen, it may increase dramatically with senility. A surge in vocalization is especially common during the night hours, as cats with cognitive dysfunction may be especially restless and disoriented due to the darkness. When an elderly cat meows and yowls loudly all night, she may be anxiously and nervously calling out for help. She may be begging, "Please take me back to the living room couch!" In senile felines, grooming usually isn't that much of a priority anymore. Even if your cat used to spend the majority of her waking hours licking and grooming away, she may just to be too tired to give the same care and attention to it as before. 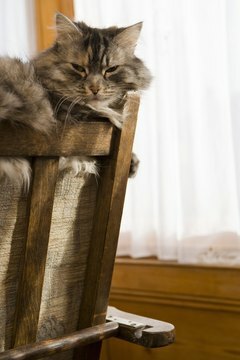 As a result, you may notice your kitty's coat looking a lot less immaculate -- and shiny -- than it did in earlier years. Uncharacteristic irritability also sometimes points to feline cognitive dysfunction. Perhaps your pet used to be the sweetest and most amiable little fluff ball on the block. With senility, your cat may become annoyed if you pet her for even one second. Cats as a general rule are big fans of oversleeping, so it may be hard to notice sleeping differences in your feline. However, if you notice your cat seems to have even less interest in being awake than before, there's a good chance it's due to age and cognitive difficulties. You don't have to just sit back and watch your pet suffer in confusion as a result of feline cognitive dysfunction. Keep things under control by making your disoriented cat's environment as stable and predictable as possible. Don't randomly move her favorite toys. Don't just pick her off and leave her in a random nook of your home, as that may lead to confusion. If you want some extra help in keeping your geriatric cat happy, content and calm, speak to your veterinarian about possible use of a senility medication such as selegiline (Anipryl and other brand names). Anipryl is commonly prescribed in cats as well as dogs for management of senility problems.